ටැන්සානියාව, නිල වශයෙන් ටැන්සානියානු එක්සත් ජනරජය (ස්වෙයිලී: Jamhuri ya Muungano wa Tanzania), යනු නැගෙනහිර අප්‍රිකාවේ රටකි. එයට උතුරින් මායිම් වන්නේ කෙන්යාව සහ උගන්ඩාව වෙති; බස්නාහිරින් රුවන්ඩාව, බුරුන්ඩි, සහ කොන්ගෝ ප්‍රජාතන්ත්‍රවාදී ජනරජය වෙති; දකුණු දෙසින් සැම්බියාව, මලාවි, සහ මොසැම්බික් වෙති. රටෙහි නැගෙනහිර මායිම නිමැවී ඇත්තේ ඉන්දියානු සාගරයෙන් සහ අප්‍රිකාවේ උසම කන්ද වන, ඊසාන දිග ටැන්සානියාවේ කිලිමන්ජාරෝ වෙතිනි. ටැන්සානියා එක්සත් සමුහාණ්ඩුව දුපත් 26 කින් සමන්විතය. රටේ වර්තමාන ජනාධිපති ජතායා මිර්ෂෝ කික්වෙට් 2005 වසරේ දී පත් විය. 1996 සිට රටේ අගනුවර වන්නේ ඩොඩෝමාය. එහි පාර්ලිමේන්තුව හා රාජ්‍ය කාර්යාල පිහිටා ඇත. නිදහස් කාලය අතරතුර ඩර්සලාම් නගරය රටේ දේශපාලන අගනුවර විය. වර්තමානයේ එම නගරය ටැන්සානියා‍වේ ආර්ථික අගනුවර වේ. ඩාර්සලාම්හි රටේ ප්‍රධානතම වරාය පිහිටා ඇත. 1964 වර්ෂයේ රාජ්‍ය දෙකක එකතුවකින් ටැන්ගන්යිකා එක්සත් සමුහාණ්ඩුව හා සැන්සිබා ස්ථාපිත කල අතර, පසුව එය ටැන්සානියා එක්සත් සමුහාණ්ඩුව වශයෙන් නම් කෙරුණි. ↑ David Lawrence (2009). Tanzania: The Land, Its People and Contemporary Life. Intercontinental Books. පිටු 146–. ISBN 978-9987-9308-3-8. http://books.google.com/books?id=qVDYbCfaPuQC&pg=PA146. ↑ "About the United Republic of Tanzania". Permanent Representative of Tanzania to the United Nations. සම්ප්‍රවේශය 31 January 2015. ↑ 5.0 5.1 "Tanzania". The World Bank. සම්ප්‍රවේශය 4 July 2015. ↑ "World Development Indicators". The World Bank. සම්ප්‍රවේශය 4 July 2015. ↑ "GINI Index". The World Bank. සම්ප්‍රවේශය 14 October 2014. 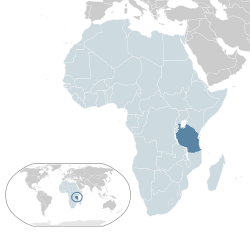 ↑ "UPDATE 2-Tanzania's GDP expands by 32 pct after rebasing – officials". Reuters. 19 December 2014. සම්ප්‍රවේශය 19 December 2014. ↑ Tanzania. Dictionary.com. Dictionary.com Unabridged (v 1.1). Random House, Inc. (accessed: 27 March 2007). This approximates the Kiswahili pronunciation [tanzaˈni.a]. However, /tænˈzeɪniə/ is also heard in English. මේ පිටුව අන්තිමට සැකසුවේ 16 ඔක්තෝබර් 2017 දින දී, 12:53 වේලාවෙහිදීය.